Ever heard of a bride surprising her groom with a wedding? 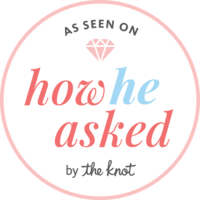 I’m not talking about little surprises the day of, like details or gifts he’s unaware of… I’m talking about the groom has no idea it’s actually his wedding day! Well, that’s exactly what Brittany did for Ryan – she planned a surprise wedding. Don’t worry, it’s not as crazy as it sounds! Brittany and Ryan had been engaged for a while, but since Ryan was working in Canada, they had spent most of their relationship long distance. Thank goodness for planes to get them to and from! After proposing, Ryan started hinting that he really wanted to do a courthouse wedding as soon as possible to make things official. Brittany kept him at bay by pushing for a traditional wedding day, but behind the scenes she was planning a big surprise! To set things in motion, she planned their engagement photos. So, one Saturday when Ryan was in town, they got all dressed up and met me for their session. Before we moved to our second location, Brittany offered Ryan a gift. When he opened it, he found a note saying “Let’s get married!”. She explained how they were going to get their wedding license that day (it was a Saturday), and then on Monday when the judge was at the courthouse, they’d get married with two close friends as witnesses. The catch was that she didn’t want to tell any of their family because she still wanted her traditional wedding day. Ryan was shocked and so excited about the surprise. He was all in! But, little did Ryan know, Brittany had another surprise for him! While the couple went to get their marriage license, I headed to the park (location #2) where I met both of their closest family members, most of which were from out of town. Her family came from Baltimore, and she’d flown his family in all the way from Canada! After Brittany & Ryan signed their license, she told him he needed to put a blind fold on because there was a second surprise. She drove him to the park and walked him all the way to the ceremony site where he was greeted by the entire gang! The groom was speechless and over the moon about the entire thing! They got married under gorgeous pine trees surrounded by their favorite people. The ceremony was intimate and spontaneous, which was a perfect fit for the adventurous couple. Brittany and Ryan are one of those couples that reminds me to live in the moment and go on adventures. I’m so glad I was able to be there as part of their ceremony, and I’m even more excited to be there when they say “I do” again in Banff next year at their big wedding reception!